November 2, 2018 – Dry with warmer than normal temperatures through next week. 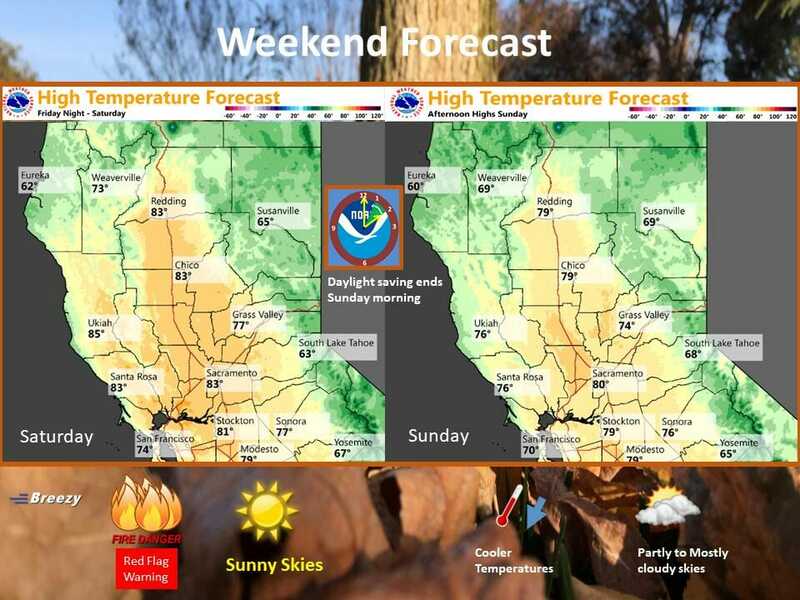 Breezy north winds may lead to elevated fire weather concerns on Saturday. High pressure aloft over the southwest U.S will bring continued warm and dry weather to Northern California. A weak shortwave trough moving through the Pacific Northwest will, however, bring a little cooling today. Even with this cooling, daytime highs today will still come in about 10 to 12 degrees above normal for early November. The shortwave moves east of the forecast area by 00z this afternoon with surface high pressure nosing quickly into the Pacific Northwest. By this evening, a fairly tight surface gradient develops over the north state bringing increasing north winds. The strongest winds will be over the Sacramento valley westward. These north winds will bring decreasing humidity so only poor to moderate RH recovery is expected. Combination of winds and lowering RH have prompted a Red Flag warning in the area of strongest winds over and west of the Sacramento valley. Minimum RH values in this region will drop into the lower teens on Saturday afternoon with temps up just a bit increasing fire danger. The Red Flag will remain in place through Saturday evening when surface gradients relax and winds decrease. Another weather system skims the north state on Sunday. This will bring a little cooling with some cloud cover over much of the forecast area but precipitation is still expected to remain north of the CWA. This system also moves quickly east of the forecast area with another round of northerly breezes developing on Monday. At this time, winds do not look to be as strong as on Saturday nor do RH values appear as low so not expecting fire concerns to be as much of an issue. Dry weather with mild days and cool nights next week as persistent eastern Pacific high pressure dominates NorCal weather. Locally breezy north to east winds at times, mainly during the nights and mornings.